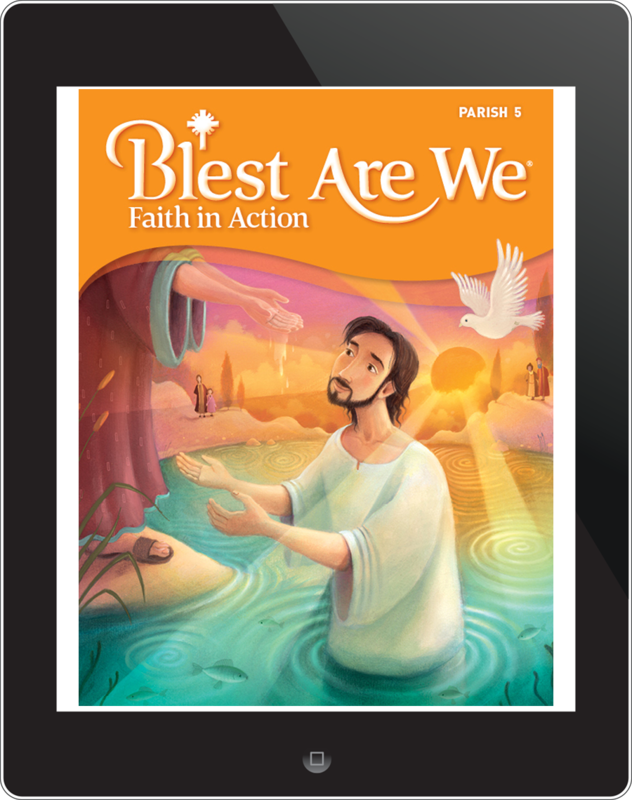 The Blest Are We Faith in Action religious education program was developed according to the four pillars, or parts, of the Catechism of the Catholic Church. These four parts of the Catechism are identified by the words Believe, Worship, Live, and Pray. Each unit of Blest Are We Faith in Action is based on a particular theme or area of Catholic belief and practice. This theme is studied over four individual chapters that correspond to the four pillars of the Catechism: What Catholics Believe, How Catholics Worship, How Catholics Live, and How Catholics Pray. In this way, the essentials of Catholic teaching are presented to the children in an integrated and balanced approach that helps them learn and deepen their faith and Catholic identity. The General Directory for Catechesis calls for the teaching of doctrine in such a way that basic concepts learned in the primary grades are further developed each year as the children grow in their capacity to understand and practice their faith. Blest Are We Faith in Action does this through a thematic approach at each grade level. Learning is reinforced from year to year, but the knowledge of the Catholic faith is expanded through the theme, providing opportunities for the learners to deepen their faith. Each level of Blest Are We Faith in Action concentrates on a particular area of the Catholic faith. These grade-level themes are determined by the needs of the parish to prepare the children to receive the Sacraments and experience parish life and by the children’s readiness for understanding and integrating religious concepts. TAKE HOME PAGES: These pages help families connect with their faith communities and share experiences related to each chapter theme. HEAR & BELIEVE: After an opening prayer and activity, the Hear & Believe pages connect Scripture and Catholic doctrine to the lesson theme. RESPOND: Saints and other holy people are brought to life through inspiring stories. FAITH IN ACTION: A response page reinforces the child’s sense of belonging to the universal Church and his or her parish community. CHAPTER REVIEW: Recall and reinforce. No matter where you are in your efforts to bring digital content to the classroom, RCL Benziger is here to help. Our digital resources expand learning opportunities for students and increase flexibility for all users. Interactive digital resources engage students and families in catechesis to help them better understand the Gospel message. Stories and lessons come alive in a digital format! Links in every chapter offer students in-depth explorations of saints and holy people, key concepts, games, and activities. Our eAssessments build on the printed Assessments books for increased student engagement and teacher flexibility. Teachers can create unique questions and choose from grade-level formatted questions, including multiple choice, true/false, matching, and short-answer. The online reporting system makes tracking group or individual progress quick and easy. Assessment continues with online Chapter Reviews for each chapter of every grade level. Our Family Gathers is designed to engage adults and families to grow in their faith and to connect with the parish community. Pairs with any of our religion resources or can be used by itself. Extend learning and gain a deeper appreciation of our Catholic faith through exclusive, free downloadable readings, prayers, activities, and more. Discover more about the holy people of the Church at SaintsRresource.com—your educational library of Catholic saints. Read personal biographies, investigate their lives, and pray with Saints of the Month. Teachers and families will find Gospel reflections, weekly questions, and classroom lessons at RCLBLectionary.com—your catechetical library for the liturgical year.